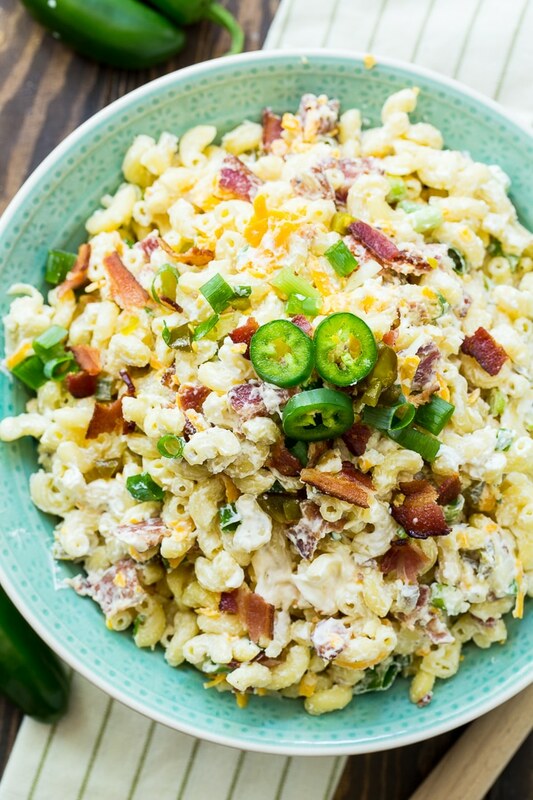 Jalapeno Popper Pasta Salad is perfect for any picnic, potluck, or bbq. It has all that awesome flavor of a Jalapeno Popper! This delicious pasta salad has a creamy mixture of cream cheese, mayonnaise, and sour cream. There’s also lots of diced jalapeno, bacon, shredded cheese, and green onions mixed in. 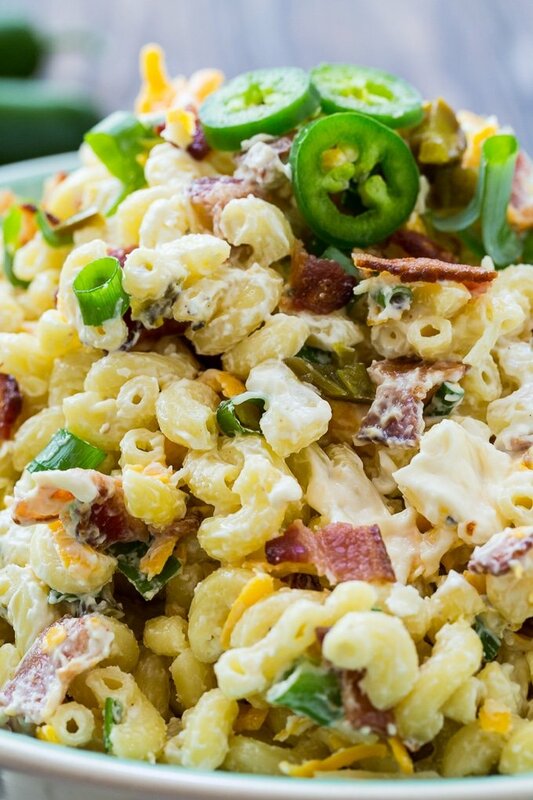 Let me tell you, this Jalapeno Popper Pasta Salad has some major flavor. I don’t like any tasteless, bland pasta salads at my picnics. This one is so creamy and a little spicy and you can vary the amount of heat by adding more or less jalapenos. 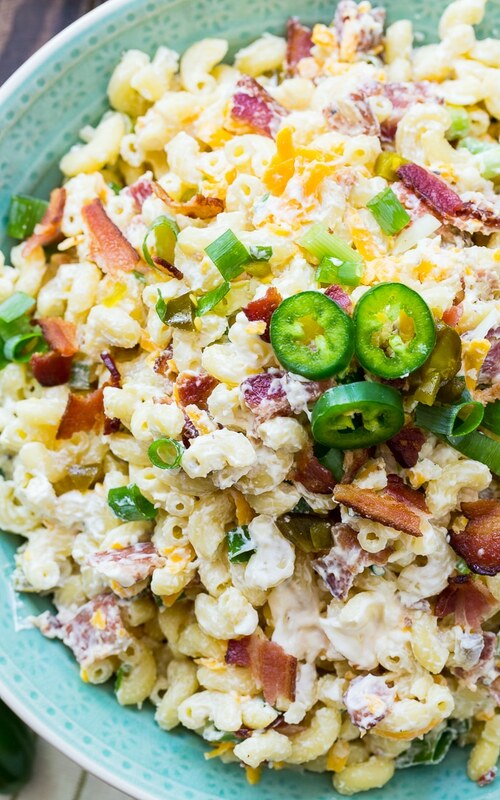 This recipe is a lot like my Jalapeno Popper Potato Salad recipe which is always a hit. 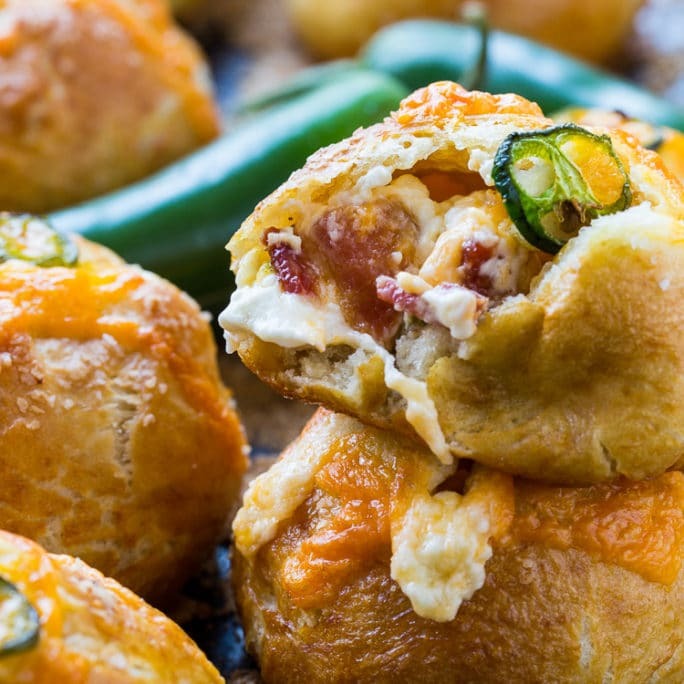 Can you really go wrong with Jalapeno Popper anything? It’s best to make this pasta salad ahead of time and let the flavors marry. But the pasta tends to soak up all the dressing over time so I like to stir in an extra 1/4 cup of mayonnaise just before serving to freshen and moisten it back up some. 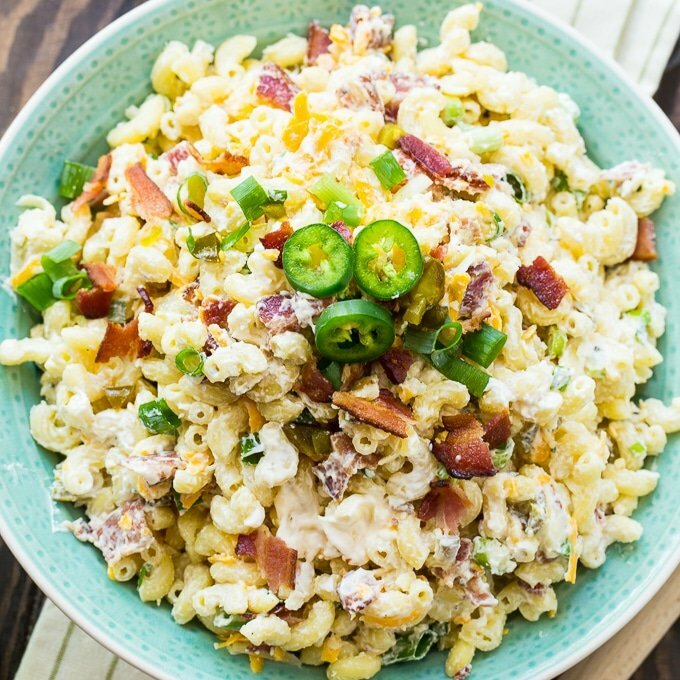 Jalapeno Popper Pasta Salad has all the flavor of a jalapeno popper. Makes a spicy, creamy picnic side. Cook pasta to al dente in salted water. Drain well. Once pasta is drained, let it cool a few minutes, and then add it to mayonnaise mixture. It should still be very warm and the heat will help smooth out the cream cheese. Stir well. Mix in jalapenos, green onions. bacon, and shredded cheese. Cover with plastic wrap and refrigerate for at least 2 hours before serving. Just before serving, mix in the remaining 1/4 cup mayonnaise. 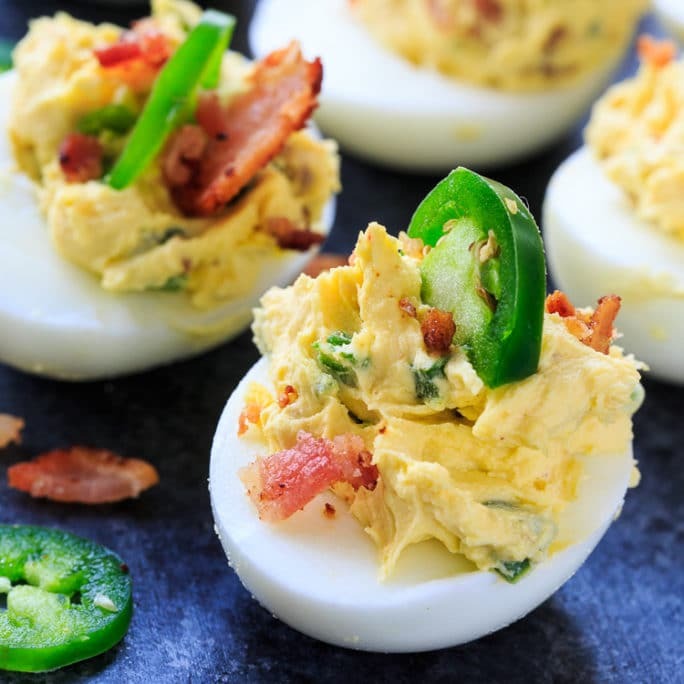 This entry was posted in Side Dishes and tagged Jalapeno, pasta salad, picnic recipes. Bookmark the permalink. When do you mix in the other 1/4 cup mayo? Looks delicious but this recipe doesn’t have potatoes in it, maybe a typo? This looks great, Christin! You always have the most fun renditions of everyday dishes. Love!